While South Australia’s road toll has decreased over the past decade, young drivers are still over-represented in road crashes, much more so than older age groups. Young drivers are at greatest risk of being involved in a crash in their first year of driving unsupervised when they are on their P-Plates. Lack of experience, night-time driving and the presence of peer-aged passengers all contribute to an increased crash risk for young drivers. The fact is young drivers need significant on-road driving experience before their crash risk decreases. The new rules, like restricting late-night driving and peer-aged passengers until young drivers gain more driving experience will save lives. 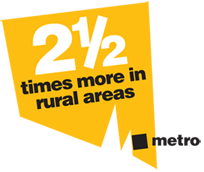 Young drivers and riders aged 16-24 in rural South Australia are 2 ½ times more likely to die or be seriously injured in a crash than those who live in the metro area. Young people aged 16-19 are dying on South Australian roads at a greater rate than in Victoria, New South Wales, Queensland, Western Australia, Tasmania and Australian Capital Territory. Many of the other states have passenger and night-time driving restrictions. Young drivers are four to five times more likely to be involved in a fatal crash when they have two or more peer-aged passengers. Carrying peer-aged passengers can distract a driver and also encourage a young driver to take greater risks. 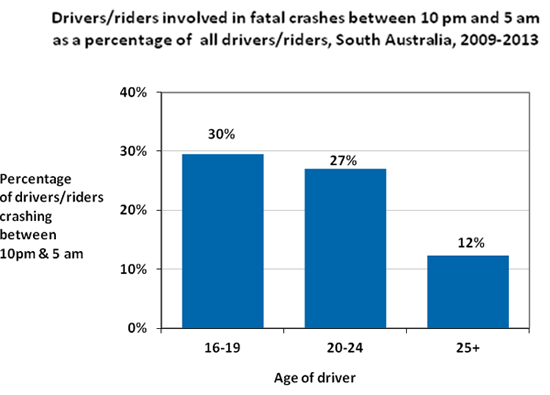 The figure below shows the drivers involved in fatal crashes with 2 or more passengers in the vehicle as a percentage of all drivers involved in fatal crashes in each age group. Of the 16-19 year old drivers involved in fatal crashes, 25% were carrying two or more passengers at the time of the crash. This compares to 12% of drivers involved in fatal crashes aged 25 or over. All drivers have an increased risk of crashing when driving late at night but the risk is greater for young, inexperienced drivers. Inexperience in night driving as well as fatigue and risk taking are all contributing factors. The figure below shows the drivers and riders involved in fatal crashes between 10pm and 5am as a percentage of all drivers and riders involved in fatal crashes in each age group. Of the 16-19 year old drivers/riders involved in fatal crashes, 30% crashes between the hours of 10pm and 5am. This compares to 12% of drivers/riders involved in fatal crashes aged 25 or over. 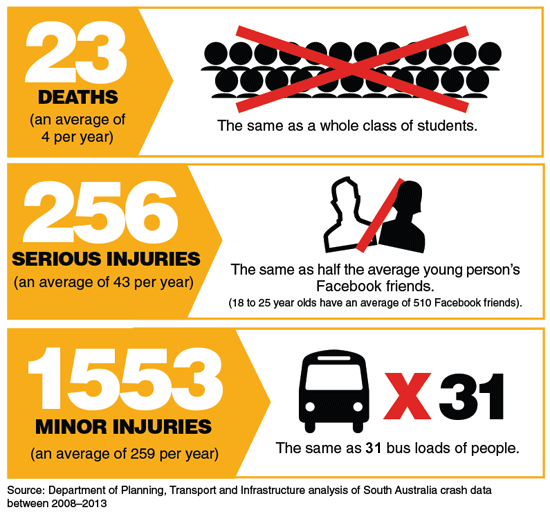 Despite significant reductions in South Australia’s road toll over the past decade, young people continue to be over-represented in the road trauma statistics. For the years 2009-2013, 16 – 24 year olds made up 12% of the population, but accounted for 22% of all fatalities and 24% of all serious injuries. 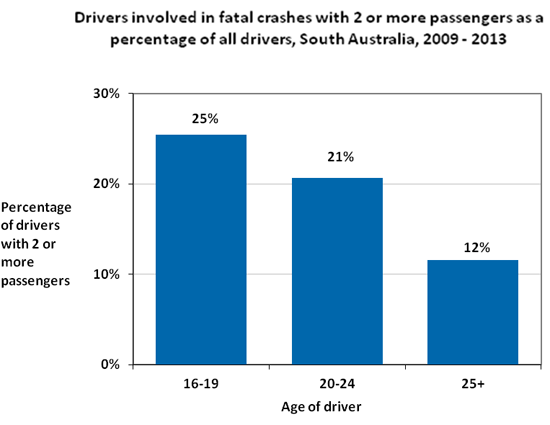 Young drivers/riders aged 16-24 years in rural South Australia are around two and a half times more likely to die or be injured in a crash than their peers in metropolitan Adelaide. South Australia has the third worst fatality rate per population for 16-19 year olds of all Australian states and territories. The first year of driving unsupervised is the riskiest in a person’s driving life. Upon getting a P licence and beginning to drive unsupervised, the percentage of young drivers involved in crashes rises eleven times. Young drivers lack of experience, night-time driving and the presence of peer-aged passengers all contribute to having an increased risk of being involved in a crash. These new laws including passenger and night restrictions are not about making life tougher for young drivers. They’re about protecting them and saving lives. They reflect world’s best practice, are evidence based and are already in place in some form in other parts of Australia. If the passenger and night-time driving restrictions had been in place in South Australia since 2008, the overall total number of injuries and deaths that had the potential to be prevented is 23 fatalities, 256 serious injuries and 1553 minor injuries. This would have saved many families and loved ones considerable heartache. The new laws have the backing of major stakeholders including the health sector, emergency services, SAPOL and the Royal Automobile Association (RAA). 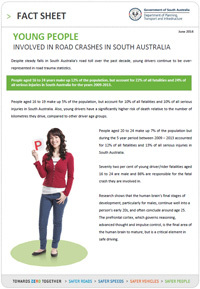 For more information read our Fact Sheet on Young People Involved in Crashes in South Australia.